"The Andy Griffith Show" Rerun Watchers Club (TAGSRWC). In most other forums, this story would be all about the delicious pork barbecue I had for lunch one Thursday back in August at Buffalo Smokehouse Barbecue, a new restaurant not far from the Arkansas River on the southeast side of Salida, Colo. It's possibly the best pork barbecue I've ever eaten. Home of Buffalo Smokehouse Barbecue...and so much more. Even to admit that is a mouthful coming from someone who grew up in North Carolina and now lives in Tennessee, two places that take their pork barbecue as seriously as their devotion to Mayberry and music. Rusty's secret may be having just the right hint of Cajun flavors that add the perfect zest to his barbecue. That and knowing not to be in a hurry when cooking barbecue. The man also makes a mean and unexpected pineapple cobbler for dessert. The family-owned restaurant (Rusty's daughter waited on my wife Mary and me during our visit) is perched on a hill just above US Highway 50. It's a spotless and unassuming place that's well designed to accommodate either a tranquil trickle of customers or a roaring busload. Some folks might not even pay much attention to a back corner of the restaurant next to the kitchen. A casual glance suggests that it's just a quaintly funky little gift shop. But what it is, is the Cleora Museum. Now, Cleora was a little mining and ranching community nearby that also served as a division headquarters for the Atchison, Topeka and Santa Fe Railway during a bygone era of the Old West. It's a ghost of a ghost town now. 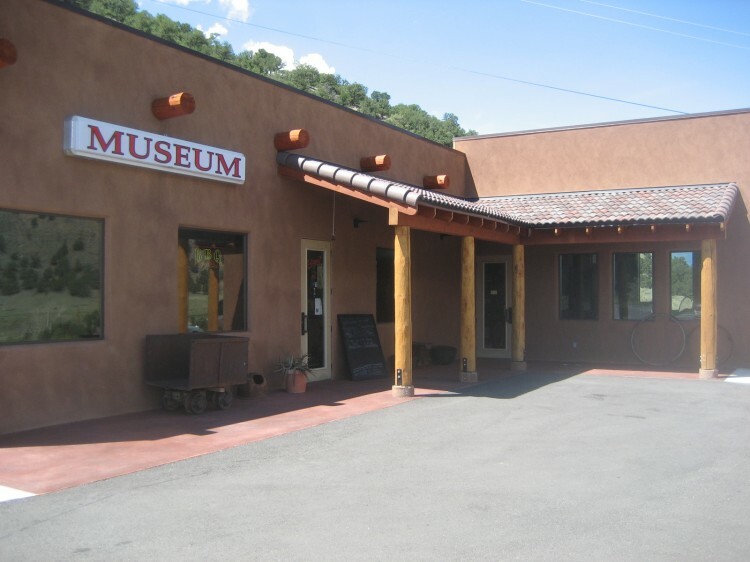 Rusty's museum has a wide variety of mining, Indian and cowboy artifacts from the days when Cleora had a little bustle to it. Actually, I'm just taking Rusty's word for that. I barely noticed all the cowboy and Indian stuff. You see, I sought out Rusty's place for one reason and one reason alone. It was a last-minute detour added to a long-planned summer vacation. It was destined to become a highlight. In fact, it's a wonder I was able to sit still long enough to enjoy my pork barbecue plate--not to mention the pineapple cobbler with ice cream--all while knowing what was on display about 10 yards away. Forget the food. Forget the Indian arrowheads. When you walk in the door of Buffalo Smokehouse Barbecue, the greeting should be simply, "Welcome to Checkpoint Chickie!" 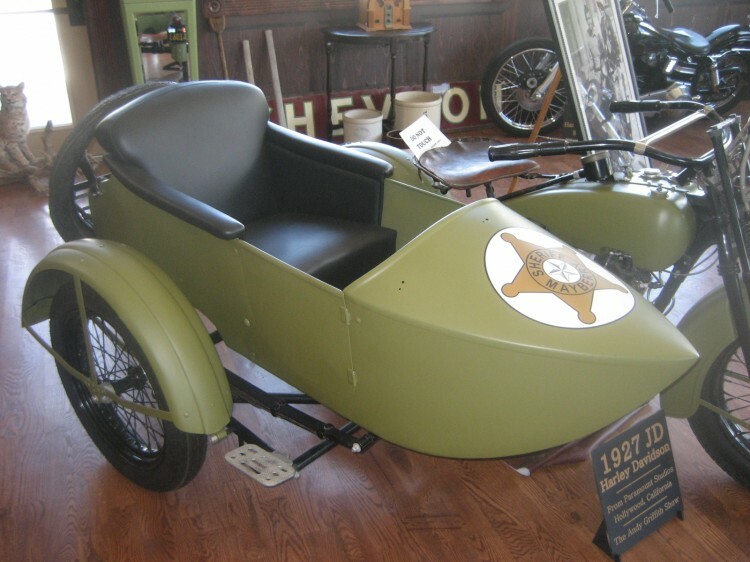 That, Mayberry friends, is because gleaming in the corner of the Cleora Museum in the corner next to the kitchen of Buffalo Smokehouse Barbecue in Salida, Colo., is the actual 1927 Harley-Davidson JD motorcycle and sidecar from "Barney's Sidecar" (Episode #111). I know what you're thinking. The ol' Presiding Goober has gotten into Colonel Harvey's Indian Elixir. Or maybe he has guzzled some of the cider that Barney left at Mrs. Mendelbright's that time or sipped the Darlings' mulberry squeezin's. Have I come to fill my vase? No. I'm dead sober. Here's the proof. Back when the motorcycle was used in "Barney's Sidecar" (which was filmed in mid-November 1963 and first aired on Jan. 27, 1964), it was owned by legendary Hollywood stuntman George Dockstader. Though Dockstader could do all manner of stunts (working with names like Hitchcock, Eastwood and Mel Brooks), he was best known for his expertise with cars and motorcycles. 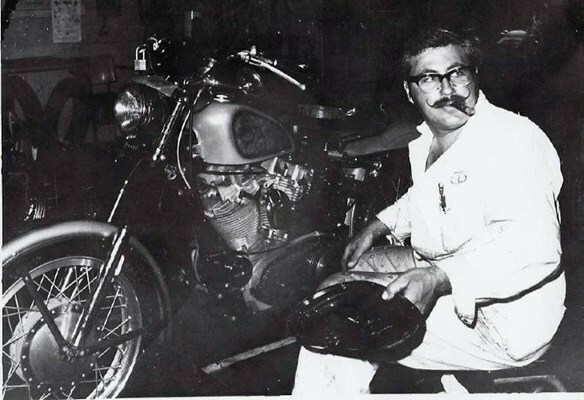 He maintained a stable of vehicles that he would modify and supply according the needs of a particular movie or TV show. 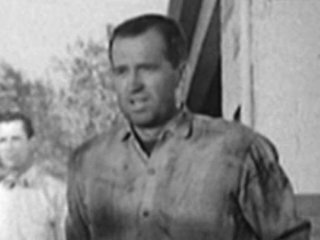 George Dockstader as Mechanic in "Psycho" in 1960. Jerry Brutsche aboard the cycle that's about to hilariously leave Andy curbside. Not to get too far off topic, but what's a sidecar story without a sidebar? The stuntman who drives the motorcycle in "Barney's Sidecar" wasn't George Dockstader, who wasn't the right size to play Barney. 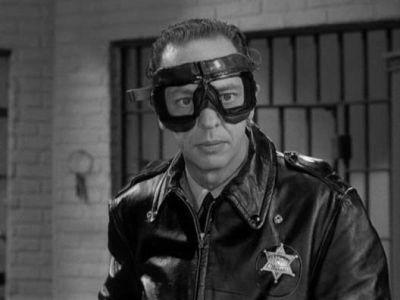 Instead it was Jerry Brutsche, who was Don Knotts's stunt double for most of Don's career, including for all of his movies for Universal and Disney. Brutsche was also Irene Ryan's stunt double for Granny on "The Beverly Hillbillies." Rusty Graves, proud curator of Barney's motorcycle and sidecar. 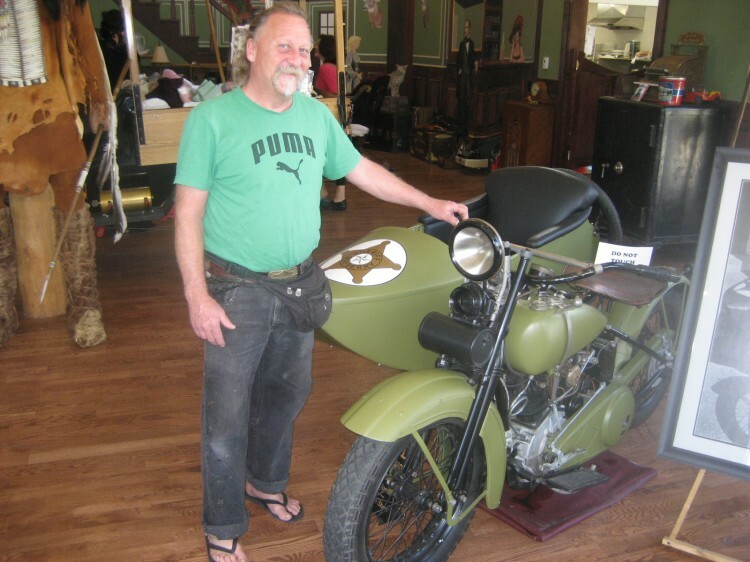 A true lover of motorcycles, Rusty has been restoring and repairing antique bikes for more than 40 years. 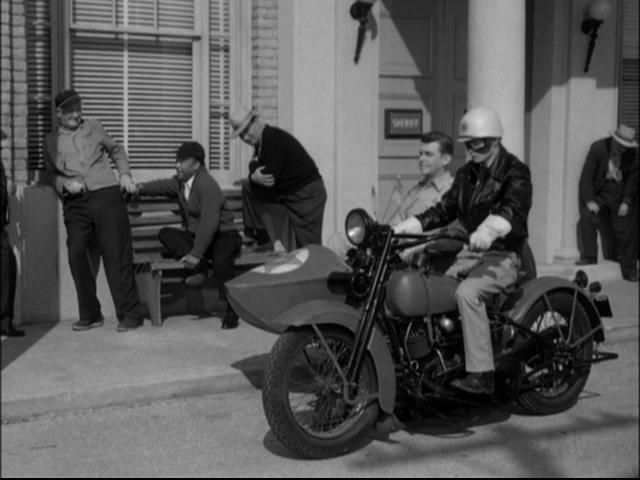 Falk also put new black vinyl seating in the sidecar, which, of course, is what Andy was going to have Barney do with oilcloth in "Barney's Sidecar," so that was a decision in keeping with Mayberry. Other than those changes and any needed parts and repairs to keep the cycle in working order, Falk left the cycle and sidecar the same. He didn't tinker with the frame or the motorcycle seat. It appears that even the tires (and especially the spare tire) are vintage, if not definitely from the cycle's Mayberry era. Bobby Falk working on another Harley. Bobby Falk kept the cycle for about 35 years. The cycle continued to work in films. 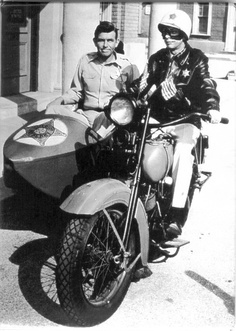 At some point (it's not clear whether before or after Falk acquired it), the cycle and sidecar were reportedly featured in an episode of "The Waltons." After the cycle's use in "Barney's Sidecar," elements, such as some of its accessories and adornments would have changed for its "roles" in other productions that came along. Small features likely were added or subtracted according to the cycle personality needed for each film. But the basic cycle has remained constant, and its current form, as restored by Falk, clearly captures the essence of its Mayberry era, its shining moment. Falk would also occasionally display the cycle at various locations and events. For example, it was exhibited at Harley-Davidson of Glendale (Calif.) for at least part of 2008 and maybe longer. 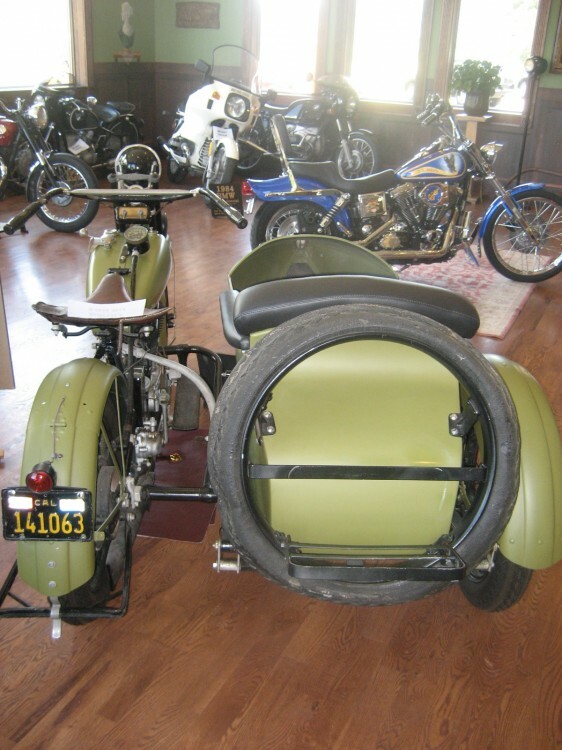 Even after Falk retired and moved to Colorado Springs in 1996 following four decades at Paramount, he kept the cycle and sidecar until his death on February 26, 2012. Before he died, Falk had made his wishes known that, upon his passing, he wanted Rusty Graves, his trusted friend and fellow motorcycle enthusiast, to have the iconic cycle. 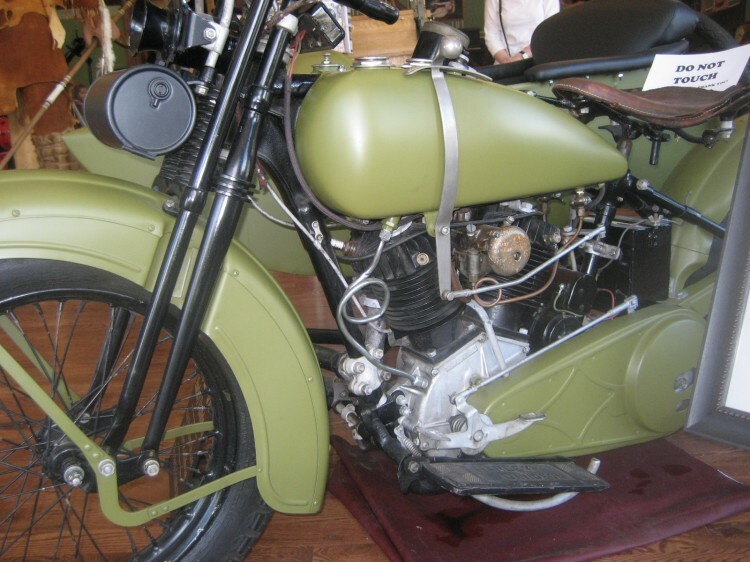 At one time, Falk had considered other possible owners and homes for the motorcycle. At least two of those possibilities would indeed have been deemed very happy homes by Mayberry fans, but the cycle was destined to continue its legacy of happiness in Rusty's care. In the end, it's reassuring to know that Rusty Graves is now the owner. Like Bobby Falk before him, Rusty has chosen to have the vehicle's title remain in George Dockstader's name for posterity. The cycle and sidecar are clearly in good hands. Loving hands. The cycle is right at home among other beautiful cycles. Andy always said the cycle belonged in a museum. And now it finally is. It may not be exactly in Mayberry, but, on the other hand, the charming little Cleora Museum in the corner next to the kitchen at Buffalo Smokehouse Barbecue in Salida, Colo., is about as close to the spirit of Mayberry as you can get. I like to think that mythical World War I veterans Al, Burt Stevens, the Milo Boys and most other folks around Mayberry would be very pleased about the cycle being so beautifully preserved and respected. And a final indication of that is right inside the front door of Buffalo Smokehouse Barbecue. That's where they've placed one of those nostalgic machines that for 50 cents will mash a penny for you to create an embossed Salida souvenir. For my part, I saved the 50 cents (and a penny). My pilgrimage to see Barney's motorcycle and sidecar was souvenir enough for me. Mary and I headed back to our suddenly very boring rented 2013 Ford Fusion. We got in the staid ingot gray sedan with all its modern comforts and amenities and headed down the steep driveway to get back on US 50. We paused for a moment as I recalled what Andy told Barney after he saw the cycle and sidecar for the last time. "Don't look back." With my eyes fixed ahead, I made the right turn to get back on US 50 going west to east, resigned in the assurance that while driving along I would have no problem pronouncing any word beginning with the letter "S" whenever I wanted. Editor's Note: TAGSRWC's Facebook page (www.facebook.com/tagsrwc) has a Photo Gallery with some additional images of "Barney's Sidecar" on display at Buffalo Smokehouse Barbecue. Special thanks to Rusty Graves for his hospitality and information for this story. And also for his indulging one particularly Gooberesque request during our visit. It would be nice at some point in time if it could end up in Mayberry ( Mt. Airy), Thelma Lou did. Love the Fusion too.